Manage and grow the key to your marketing success: your email mailing list. Easily upload your current list of contacts ​&​ ​email addresses​. Whether you built your mailing list through an opt-in form or sign-up form you can use​ Excel, Outlook, Salesforce, your e-commerce platform ​or​ wherever you currently store your contacts email address, we make it easy to upload them to your Constant Contact account and start sending ​your​ email campaign​​. 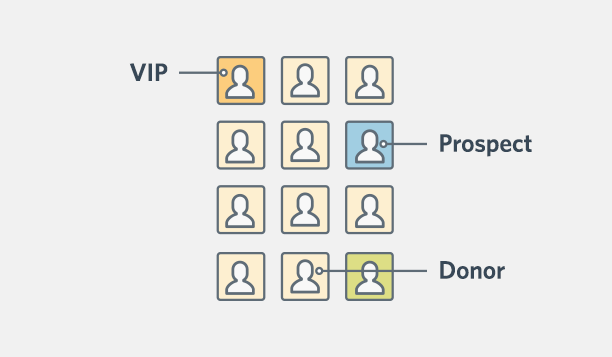 Use tags to categorize contacts on your targeted email lists. Segment contacts to send targeted email campaigns. Our contact list management and segmentation tools empower you to create customized segments based on your recipients’ engagement with your emails, location, company details, and already-existing​ distribution​ lists—all so you can send targeted emails with relevant messages ​for specific subscribers​. Constant Contact’s powerful email list management ​(email list cleaning service) automatically updates duplicate and unsubscribed contacts for you. Unlimited storage and custom fields. Securely store as little or as much contact information as you want with each email address​ in your email database​—like company, birthday, website, mobile phone number, account number, and more. 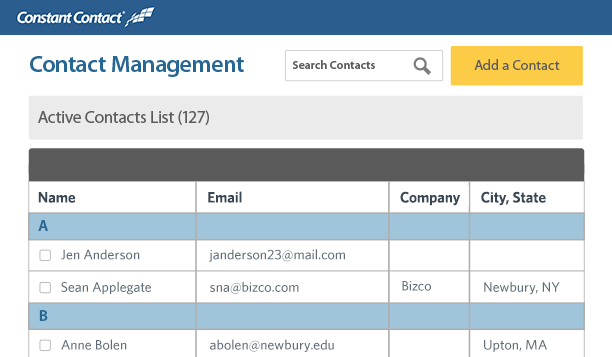 Capture new contacts with our sign up tools. Grow your email list with our list-building tools to capture new contacts on the web, through social media, mobile, in-person, and through our integrations in the MarketPlace. ​Some of these email sign up tools use an opt-in form or email sign-up form on your site to help build your email list. "Constant Contact makes it easy to create as many contact lists as we need. I can add an email address to multiple lists at once, or a reader can subscribe to several email lists. This allows us to send targeted emails. Sending people only the emails they want makes readers happier, increases open rates, and makes my email marketing efforts—and my time—more effective."